DAZN Group Executive Chairman John Skipper announced today that Gennady “GGG” Golovkin will fight the rest of his career on DAZN, the world’s largest sports streaming platform. 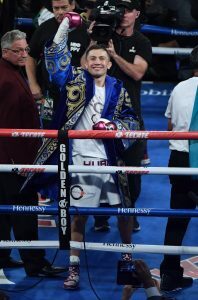 The six-fight global partnership between GGG Promotions and DAZN will see Golovkin fight twice a year on the platform for the next three years. Unlike many of his recent bouts, Golovkin will no longer appear on pay-per-view. Instead, his fights will be available to all DAZN subscribers at no extra charge. In addition, GGG Promotions will present two cards per year on DAZN beginning in 2020. Golovkin plans to return to the ring in June against an opponent to be named at a later date. The announcement sets up DAZN to stream blockbuster fights within the middleweight division for the foreseeable future, with all of the division’s champions and many top contenders regularly appearing on the platform. As part of the deal, Golovkin joins the growing family of DAZN ambassadors including Cristiano Ronaldo, Neymar, among others. Golovkin’s fights will be available in all DAZN markets, in addition to his native home of Kazakhstan. Since launching in 2016, DAZN has rapidly expanded to nine countries – including Austria, Brazil, Canada, Germany, Italy, Japan, Spain, Switzerland and the U.S. – across four continents, with the intention to reach 20 markets by 2020. DAZN will share details shortly regarding a Los Angeles-based press event next week where Golovkin and Skipper will discuss the partnership.